These dangling earrings, we decided to call “123 Earrings” is constructed using only 3 materials; copper wire, briolette and ear wires. With this tutorial from XQDesigns you will learn how to wire wrap and make loops. A simple technique of creating a bail made from twisted wire is also introduced in this tutorial, as well as wire wrapping a briolette. Learning these techniques you could also come up with a pendant by creating a bigger circle or pendant frame and using bigger size briolette. This is a fun project! Learn a simple trick to coil the wires that looks complicated. 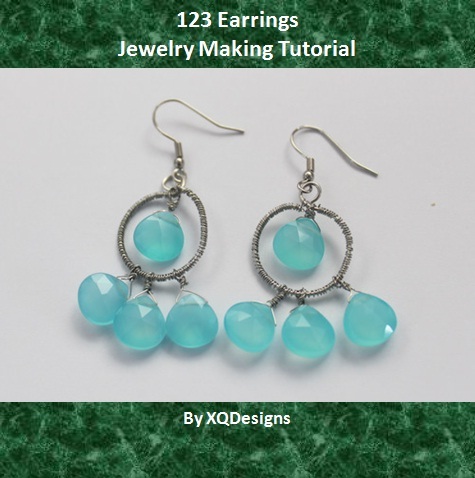 This tutorial shows step-by-step pictorial guides in making the earrings. Also include tutorial of making ear wires. 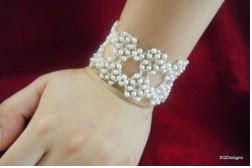 This is an elegant bracelet using Swaroskvi pearls and Japanese seed beads. The tutorial comes with pictorial step by step guides. So it is easy to follow even for a beginner. You may make a matching necklace as well. 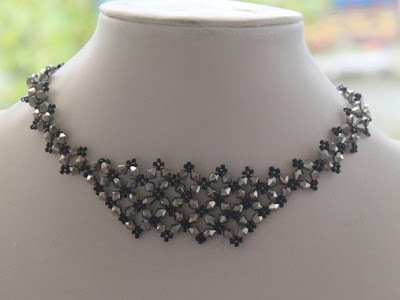 This is an elegant necklace using sparkling crystals and Japanese seed beads. Depending on the color you choose, it can turn up to be very sparkling looking or classic looking. 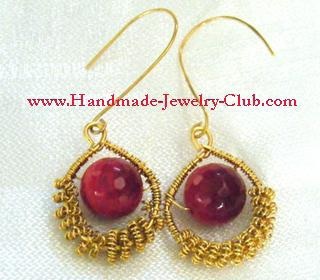 The design and the sparkling beads will make this a wonderful jewelry to be worn during special functions or parties. The tutorial comes with pictorial step by step guides. So it is easy to follow even for a beginner. You may make a matching bracelet or earrings as well! This is a 20-inch elegant chocker necklace made of turquoise chips. This project looks rather complicated but it is actually very easy to do. You can wear it at different occasions. You can even wear it while having fun at the beach and surely you will look elegant, just like a princess. 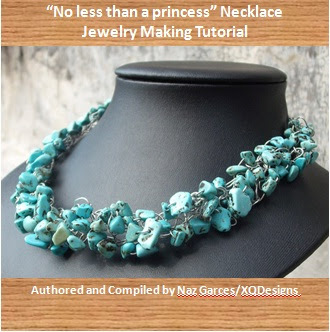 Creating this necklace involves knowledge in basic crochet and is suited for confident beginners. This tutorial is jointly developed by Naz Garces and XQDesigns.